The ultra-high vacuum (UHV) laboratory in the DESY NanoLab (currently located in building 3). The DESY Nanolaboratory (DESY NanoLab) is a facility providing access to advanced nano-characterization, nano-structuring and nano-synthesis techniques which are complementary to the advanced X-ray techniques available at DESY’s lightsources. 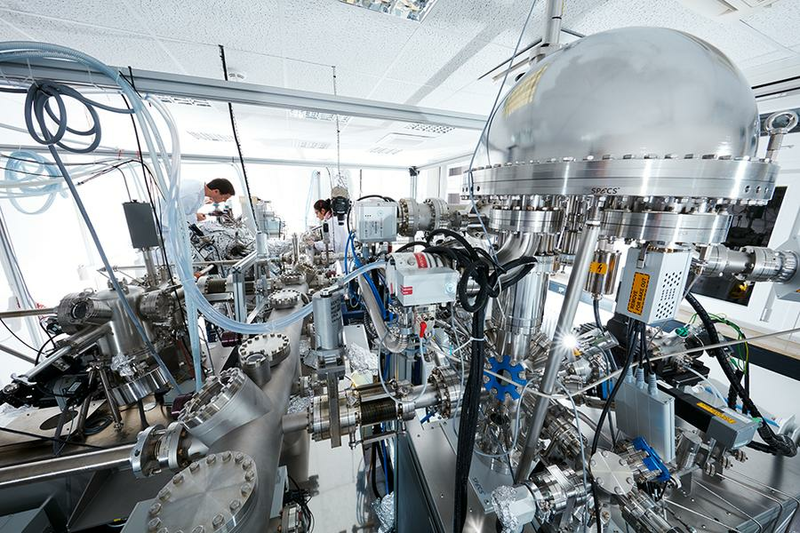 The DESY NanoLab is being developed and operated by the DESY Research Group X-ray physics and nanoscience as facility for users and for in-house research. Currently, the facility is located in building 3 (close to the guest house), but will move into the new Center for X-ray and Nano Science (CXNS) to be constructed close to the PETRA III Max-von-Laue Hall, allowing easy and fast access to the PETRA III beamlines. The scientific instrumentation of the DESY NanoLab is being continuously extended. Currently, an ultrahigh vacuum (UHV) setup for surface preparation and nanoparticle growth is available that comprises additional surface science techniques such as X-ray photoemission spectroscopy (XPS) and reflection-absorption infrared spectroscopy (UHV-RAIRS). A scanning tunneling and atomic force microscopy (STM/AFM) will be implemented in the near future. In addition, an X-ray diffraction laboratory is operational, which allows specular reflectivity and grazing incidence X-ray diffraction measurements on a routine basis using sealed tube Mo and Cu X-ray sources and parabolic multilayer optics. A high resolution field emission scanning electron microscope (FE-SEM) and a dual beam focused ion beam (FIB) is available for users. Access to DESY NanoLab instrumentation is possible via submission of a research proposal for a combined access to NanoLab and the DESY lightsources PETRA III or FLASH via DOOR during the calls for proposals. Within this framework, DESY NanoLab currently offers the instrumentation listed below. Transnational access to instrumentation of DESY NanoLab and, if required, to a limited amount of X-ray beamtime at PETRA III can also be requested via a research proposal that can be submitted via the European Union research project Nanosience Foundries and Fine Analysis (NFFA). Research proposals will be evaluated every three months. Once the combined proposal for Desy NanoLab and one of DESY's lightsources is accepted, access to DESY NanoLab is scheduled prior, during or after the X-ray beamtime to ensure a successful and smooth experiment. A member of DESY NanoLab will assist in the proposed experiment or teach the user accordingly, depending on the complexity of the applied instrumentation and the experience of the user. Operation hours of DESY NanoLab are 8 am – 5 pm on working days. It is advisable to contact a member of DESY NanoLab (NanoLab@DESY.de) in advance of submitting a proposal and to discuss the feasibility of an experiment.